Pushkar is the abode of Lord Brahma Maharaj. Sri Brahma Temple, World's one and only Temple dedicated to Lord Brahma is located here. The temple is situated on the banks of the Pushkar Sarovar(Lake). 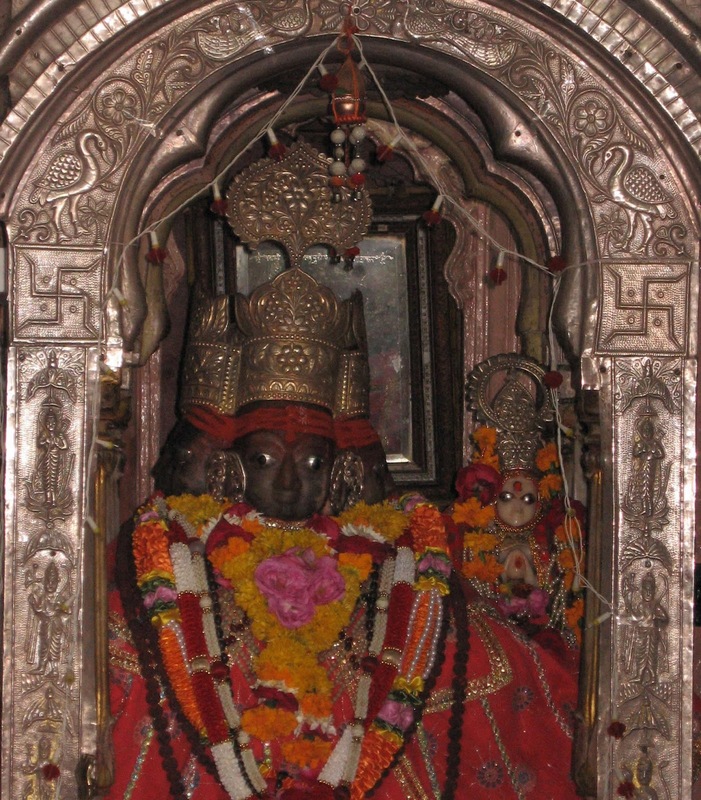 The temple is located at a distance of 12KM to the North-West of Ajmer City, Rajasthan, India. Gruhastas are not allowed to perform Poojas to the main deity of the temple. Only monks/hermits are eligible and permitted to perform Puja's to the Lord. And also monks should belong to Parasara Gotra race. There is a Mantapam in which Silver Turtle is situated opposite to the main temple. 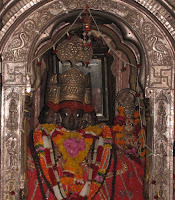 Pushkar is the abode of Lord Brahma. The present Temple was constructed in 14th century. It was said that the ancient temple was 2000 years old. The temple town situated around the beautiful lake is surrounded on three sides by hills, while the fourth side is cordoned by sands which have drifted from the plains of Marwar. It is one of the most revered places for Hindus and referred as "Tirth Raj" or the king among places of pilgrimage, just as Kashi(Banaras) is their 'guru' or preceptor. No pilgrimage to Badri Nath(Himalayas), Jagannath (Orissa), Rameshwaram (Tamil Nadu) and Dwarka (Gujarat), the four principal places of pilgrimage for the Hindus is complete till the pilgrims bath in the sacred waters of Pushkar. The most important festival celebrated in this temple is "PUSHKARA JATRA" in the month of Kartihika(October/November). It begins from the 10th day of the bright fortnight of the month Karthika to Karthika Pournami. 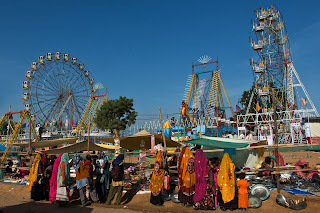 The main attraction of the Jatra is Rajasthani Tholubommalata (తోలుబోమ్మలాట), Handicrafts, Ornaments and more. Special poojas, Prayers are performed on the days of every month Pournami & Amavasya and Karthika Pournami. 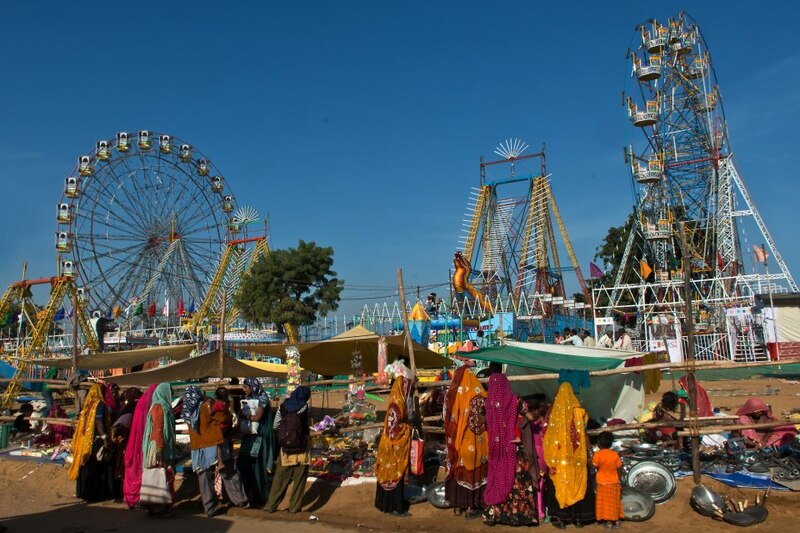 Camel fair is the special attraction in the Pushkara Jatra. According to Padma Puran, the Hindu religious text, Lord Brahma was in search of suitable place for a Vedic yagna. While contemplating, a lotus fell down from his hand on the earth and water spurted from three places, one of them being Pushkar and Lord Brahma decided to perform his yagna over here. Pushkar means "Lotus" as the Lotus flower fell down from the Lord Brahma, this sacred place is called as "PUSHKAR"
Shree Brahma Temple is situated on the banks of Pushkar Lake. The sacred Pushkar Sarovar(Lake) is situated at an altitude of 1580 feet above from the sea level.The beautiful Pushkar Lake is a sanctified spot, considered as old as the creation, and has been a place of pilgrimage since time immemorial. 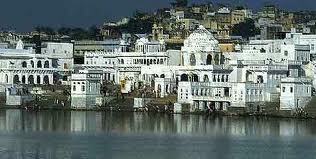 It is surrounded by 52 bathing ghats, where people come to take a dip with deep religious faith rooted in their hearts. Every day religious rituals and Homas are performed at these ghats. In our Indian Epics Sri Ramayanam & Mahabharat, it was mentioned about the importance of the Pushkar. Temple Timings are -> 5:30am to 1:30pm and 3:00pm to 9:00pm.